There are those rare moments that shake us out from under the spell of our routine, the seeming mundanity of every day existence. The sameness, the confusion, the seeming lack of clarity about what, exactly, we are doing, or what our past might mean, what our future might hold. Sometimes “now” becomes this loaded, explosive place, where everything makes sense, or at least converges on itself. The past 48 hours have been such a time, an opening, a channel through which life’s mystery has been free to flow, vigorous and all-consuming. Sunday morning (our twelfth wedding anniversary) began innocently enough, as I woke early for a 5K race with my dear Students Run Philly Style team. This group has energized me to no end. Over the past year, through mentoring middle and high school runners, my own relationship to running has been transformed in profound and unexpected ways. I’m supposed to be “helping” these kids, but in actuality, it’s been a lot of the other way around. So I met up with our sweet team, and pounded out a quick 3.1 miles through air thick with humidity. I started the race with two acquaintances, both of whom are pregnant. At first, I fought to participate in the conversation, but as these two lovely, excited young women chatted on, I soon realized how invisible I felt in the context of their shared experience. I’ve been a parent now for three and a half years. I have no real desire to have more children. The life my husband and I have built since our son arrived has felt right in so many ways. But the lingering sadness of my cancer, and what it stole from me, can visit most unexpectedly, and there it was, out of nowhere on this hot Sunday morning, driving me to push myself faster across the finish line. As if to show my illness everything I can still do, how strong I have become. Stronger, actually, than I ever would have been, had cancer not come calling. These moments, these constrictions in my heart that are the purest and most inescapable legacy of my cancer experience, have become so rare. And so they knock me sideways, maybe harder now than ever before, when they were more chronic, more a matter of course. The looming shadow of my impending annual checkup with my oncologist may have made me extra susceptible that morning. As one of my survivor friends tweeted at me, “Nothing screams Monday morning like a visit to the oncologist.” And so, yesterday morning, coincidentally (or perhaps not) in the wake of the previous day’s emotional shake-up, I hauled myself up to Fox Chase Cancer Center for the perfunctory ten-minute office visit with the doctor who saved my life almost eight years ago. At this point, I no longer have any conscious anxiety about these appointments. Nevertheless, they are like small earthquakes, disrupting the ground beneath my feet, reminding me that all is uncertainty. A few hours later, I packed up my family and drove to New York City, where my husband and I were to spend the evening celebrating our anniversary with a night of music. This rare night out, though, turned into something more mystical than I ever could have expected. For the universe, it seems, pushing circumstances and feelings into a kind of beautiful collision, was intent on something totally beyond my control. 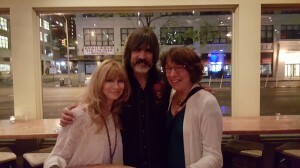 Larry Campbell and Teresa Williams, as any fan of Bob Dylan and The Band knows, make incredible music together. They are torchbearers for the legacy of my beloved Levon Helm. The room where they played last night became the site of something inarticulable. Levon, whose struggle with cancer was coming to and end just as the most recent chapter of my own life was beginning, was present in that room. I don’t think I have ever felt anything so powerfully. The last song of the night, “Chest Fever,” was a searing homage, and I found myself, after entirely too much wine, with tears falling fast and furious down my cheeks through the song’s entirety. The show ended, the tables cleared. Mike and I hugged, and I couldn’t stop crying. Wine will do some strange things to my emotional state, but this was more than that. “I don’t know what happens to people when they die,” I sputtered to Mike as he smiled at me and held me close. “But I could feel Levon here, he was present tonight.” To my relief, it was clear my husband knew exactly what I meant. There is a reason we have been together for eighteen years, married for twelve. Music brought us together. Cancer tried to tear us apart. There are some connections that can never be broken. These gracious and gifted strangers expressed gratitude for the story and sentiments we shared with them, and wished us well. And I stumbled out into the strangely cool air, feeling like I had just come close to something which some people might call god. Not god with a capital “G,” not an omniscience. But the feeling that we are all connected, if we can just figure out how to get to the place where that connection is unearthed. Last night, after a soul-stirring few days that seemed defined largely by the legacy of cancer, music blew through a room in Lower Manhattan, the living and the dead joined hands, and the circle was made complete. This entry was posted in fellow fighters, Infertility, Life After Cancer, music, running. Bookmark the permalink.